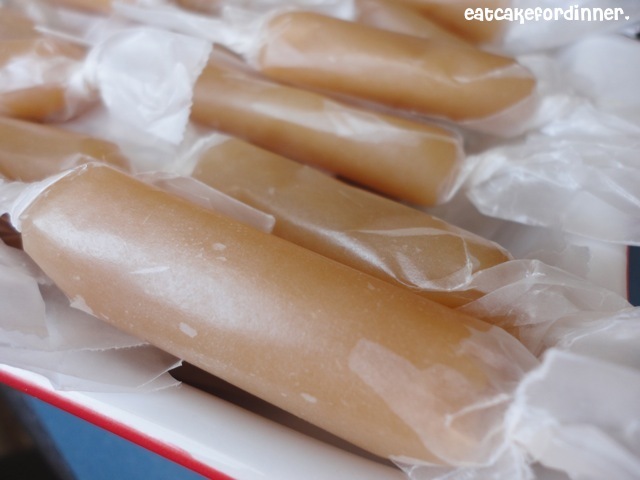 Eat Cake For Dinner: Super Easy Microwave Caramels - The Real Deal! 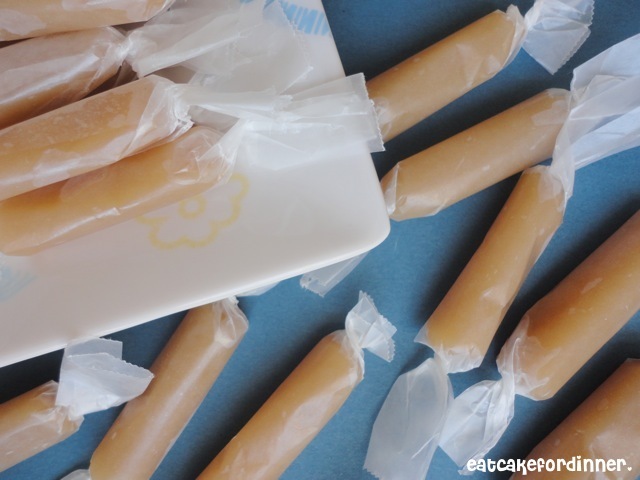 Super Easy Microwave Caramels - The Real Deal! These caramels are the real thing! They are not too good to be true. Homemade caramel is not just for the holidays anymore. They are made in the microwave. They are done in 6 minutes. They are rich and creamy and melt in your mouth. I was so skeptical about this recipe and I thought there was no way possible that these would work, but THEY DID. I was shocked at how easy they were to make and how delicious they tasted. You no longer have to be scared about making homemade caramel thanks to this recipe. I can't wait to try homemade turtles, caramel pretzels, caramel brownies and so on and so on. I will never buy store-bought caramels ever again. Put all ingredients in a large, microwave safe, bowl. Microwave for 6 minutes, stirring every 2 minutes. Spray an 8''x8'' dish with cooking spray and pour mixture in. Let cool and cut. Wrap in wax paper. Jenn's Notes: Seriously AMAZING! Since cans of sweetened condensed milk only come in 14 oz., I measured 4 oz. using my kitchen scale and it ended up being about 1/4 cup plus 2 Tablespoons. I poured my caramel into an 8''x6'' dish and we ate one row out of it the first night, then when I woke up the next day, it was completely filled in again, like I didn't even eat any. So, eventually it will spread (it takes quite awhile for this to happen). If you individually wrap them and are planning on taking them somewhere, I would keep them in the fridge and bring to room temperature just before serving. They will hold their shape for several hours, before they start to flatten. Do you suggest trying this with caramel apples if they spread and "melt"? Otherwise they sound sooooo easy!!! If you cook it a bit longer...say 1 more minute, it may hold it shape better. I'm going to give this a try and see. I'll let you know what happens! Homemade caramels- in the microwave?! I'm walking to my kitchen right now. yum, I am so trying this. And you can make peppermint patties with the left over milk, so good! Wow! Looking forward to all the other goodies you plan on making with this *too easy to be true but it works* caramel recipe. Thanks for sharing. After I read this, I just couldn't help myself! Ran to the kitchen praying that I had all the ingredients to give this a try. Then I had to keep getting a clean spoon every time I stirred cause I kept licking my stir spoon! These were super easy to make and incredibly yummy!!!! Thanks so much for posting! Love reading your blog! I am so glad you gave it a try and that you liked it! I can not tell you how excited I am to try this!!!! I LOVE caramel!!! I was deciding what to make for dessert tonight and I am glad I came to your blog fist! I will be in the kitchen in a few minutes! Also, wanted to let you know I got the cookbook today, thank you so much! I was so excited! I had bought the ingredients and was planning to make the sausage orzo skillet today and thought it was really appropriate the cookbook came today. So many recipes I want to try. The sausage orzo skillet was really good, I used crushed tomatoes instead of stewed, and I added garlic and a little bit of sugar. I used the sugar to cut the tomato taste. It turned out great! Oh, wow! I'm going to have to try this. And you're right, the uses are endless! Thanks for sharing on Crazy Sweet Tuesday! How awesome is this! Especially since you don't need a candy thermometer. I love it. OMG I have to try this!! My daughter and I make a mean caramel on the stovetop but this is a huge endeavor. I love the microwave option with so much less time! Thanks so very much for sharing! I just pinned this! These look delish, as do all your recipes!!! I found this via Tip Junkie, Tip Me Tuesday. That's so awesome. I love that they almost have a regenerative quality to them...how crazy is that?! Thanks so much for linking this up with Mop It Up Mondays at i should be mopping the floor last week. Enjoy the rest of your weekend! I didn't know you can do caramels in the microwave, now I know, I will have to try this one soon, I love those soft caramels like this! I think I may have cooked mine too long. They were very very chewy. Are they supposed to be soft? I cut the recipe in half, and I am wondering if I messed up on the measurements. Maybe you have a more powerful microwave than I do? Mine were melt-in-your mouth soft. Definitely not overly chewy? I have tried cutting candy recipes in half before and they never turn out? I'm not sure? I would definitely try again though, because they are amazing. You can get squeeze bottles of sweetened condensed milk in the Mexican foods (imports) aisle. I found mine at Walmart, and it is the same stuff! Just keep in the fridge after opening. Awesome recipe! I can't wait to try it! they also carry 4 oz cans at my local Walmart but I understand you can freeze any leftover condensed milk. Just made it and it's now cooling. If my taste testing is an indication if it's going to be good or not, it's going to be yummy! A great idea for the leftover condensed milk is pour it in a glass pie plate, cover completely with aluminum foil, put in a water bath and bake for about an hour, can't remember exactly what temperature(you can probably google it) and when its done you have a great dulce de leche sauce for ice creams, cupcakes, whatever. Sounds like it isn't the perfect caramel recipe. You need it at a higher temperature if you don't want to have to peel them off of the wax paper with your teeth or have them melting into each other because the consistency is all wrong. Lazy recipe, low quality results. I made them and they worked great! I don't think it's low quality at all. It's pretty darn good for the easy method that it is. Best results are on the stove with your full attention. Your effort spent on your product yields great results and a STABLE caramel. You don't necessarily need a thermometer, you just need to know what the caramel looks like at certain temperatures. These sound promising and I'm going to try them. I stay away from candy making because I'm certain I will burn myself. These don't seem to be as dangerous. Yes, it would be yummy with vanilla! I was wondering if you have tried adding the vanilla and know the right amount to add without altering the consistency? Thanks! I haven't yet, but I think you could add 1 teaspoon and it would be fine. Wonder if you made 3 layers (1-caramel, 1-melted marshmallow, 1-caramel), would it be like See's Scotch Kisses? I couldn't agree more about the marshmallows. I too now want the See's Scotch Kisses. I just made these...YUMMY!! Thanks! Can i use golden corn syrup instead of light corn syrup ? My wonderful Mother made these caramels years ago and everyone loved them, she even mailed them to her sister in Anchorage! After she passed away, no one in my family had the recipe :( I am beyond thrilled to try this! I've made the caramel more than once but every time I make it, it's rock hard and taste like a werthers but I did everything right, and put it in the microwave for 6 mins. stirring every two. An ounce is a measure of weight and volume. A cup has a volume of 8 oz. 1/2 cup is 4 oz. Do you think I could substitute the corn syrup for something else? Because I dont think they sell corn syrup anywhere in my country. Maybe simple syrup or agave or honey? Let me know if you think of something b/c I'd like to try this! Boy could we get in the business of corn syrup trading to some of these ladies. I will ship you some if you ship me back some cookie goodness from your side! Jenn, a normal (full size) Microwave runs at about 1100 watts now, older or smaller models run at lower wattage. Some of the newer ones can run even higher and have the built in convection function, all this results in a totally different amount of heat applied to the mix from different microwaves even on the same setting ("High" is not a temperature, all settings on a microwave are based on the total wattage. The size and thickness of the bowl could also be a factor since it can act like a heat sink and draw heat out of the mixture. Caramel is picky so if a batch turns hard it needs to be cooked less in that environment. Jenn, the sise of your bowl and wattage of the microwave should help people with newer/larger units adjust, microwave settings are never a science as no two brands/ages/wattage cook the same. From the replies it looks like people have gone past the caramel stage into the various "hard crack" and "soft crack" stages (meaning they have over cooked).. basically when that happens they need to back down the times the next time. While my main business is chocolate (ccberries.com), caramel in it's various forms comes into play. The smaller the batch the less leeway you have, once it gets too hot: things get too hard when it cools. The basic recipie is OK: but people will have to tune it to their equipment, and when they do so it should;d be changing one element at a time. (changing time/temps and ingredients at the same time will never show you what needs to be changed). I just made these and they taste great - but they are hard and very chewy - like a sugar daddy candy. I will definately try these again, but i will go with the 1/2 cup sweetened condensed milk and only about 4 minutes in the microwave as mine must be a higher wattage. Very tough though! These caramels taste just as good as the stuff my grandmother makes (on the cooktop w/candy thermometer) each and every Christmas! I do have a 1000 watt microwave and stirred every 1 to 1.5 minutes and only did so for a total of 4 minutes and 40 seconds. And I did add vanilla! YUM! Thank you for this recipe Jenn! Jenn - I did use a 1/2 cup. And, I'm on to my second batch to take into work! I did this with my daughters not too long ago. We LOVED it! I am so thankful to have a recipe that doesn't require a thermometer (ummm cause I don't have one). We are going to do it again today after they get back home from school. We loved watching it make a mess in our microwave, and because my microwave was clean, we loved cleaning up the mess LOL. We were lazy though, we didn't cut it up and put it individual wax paper, we just left it in the glass pan with a lid and then cut out pieces as we wanted it. We do that with cake and brownies too... so why not the caramel? Thank you so much for sharing this with everyone. One question, do you know of any way to make it more shelf stable so that we don't have to keep it in the fridge? Will this carmel recipe work in popcorn balls? I made these earlier this afternoon and they are phenomenal! Mine are incredibly soft and I would honestly add maybe another 30 seconds to 1 minute to firm them up just a little bit, but it's almost an exact replica of my stove top caramel recipe. Thank you for posting this! It's especially helpful for me because I'm in my first trimester and can't get much accomplished between the morning sickness and fatigue lol. I just tried these and although the taste was amazing, the consistency was way too hard. Glad to hear about different time suggestions for different microwaves as I figured that was the problem and from the reading seems I was right. I will definitely try these again and cook less. Wish you would go back and the notes about the microwave wattage and times to the recipe so I would have checked before cooking and not wasted a batch. Otherwise in love with them. I have been meaning to do that. Thanks for the reminder and I'm so sorry for the wasted batch. I've made these a few times & they always turn out perfectly! I have used 1/2 cup of sweetened condensed milk every time because 4 ounces should be half a cup anyway. A cup equals 8 ounces, so 4 should be 1/2 cup, right? Thanks for your recipe! I love it! People can't believe how easy it is to make these when I tell them I made them in the microwave! These are PERFECT! I have a love/hate relationship with every caramel recipe. But not this one. So easy. So delicious! THANK YOU! Ok, so I thought I would NEVER find a recipe for caramels that would rival my mother in law's. This is as close at it gets!!! Can you add a little vanilla flavoring and not mess it up? Thank you for making some Christmas giving a little easier. made these yesterday and are amazing. Only problem they stick to wax paper. Any suggestions? And couldn't you add nuts at the end? AH-MAZ-ING!!! My family and I are in love with these super easy to make and oh so delicious caramels! I used 1/4 butter and 1/2 cup sweetened condensed milk. I microwaved 6 minutes, stirring every 2 minutes and they turned out perfect. I put the pan in the fridge to set. After about 30 minutes, I set the pan out on the counter to warm just a bit. Then took a large knife and cut squares and wrapped in saran wrap. So simple! Thank you for this wonderful recipe! So, in true "newby" fashion (I have NEVER made any type of candy before), I read all the directions and EVERYONE's tips. 1000 watt microwave for 5 minutes, stirring at 1 minute intervals.....caramel soup. 2 minutes.....starting to gel.....4 minutes more....SUCCESS!!!!!!! So, for anyone counting, that's 11 minutes! But, I did put it back in the fridge in between to see if I had it right. My 4 year-old and I are totally thrilled! Seriously, if a 4 year-old can do it, ANYONE can pull this off! For an interesting twist, you can try adding about half a teaspoon of orange extract to the caramel mix! Thanks for this recipe!!! Love your idea here! I am going to adjust this for vegan gluten free and allergy safe kitchens and see what comes of it! Then I will post the results sometime soon and include a link to your post here :) Fun challenge I think! I used to sell Microwaves back in the 1980's haha, we were told that the Magnetron tube (which makes the micro-waves) gets weaker as it ages, so that by five years of use, the microwave oven has much less power on HIGH than it did when you first bought it. So even if you are using the SAME microwave, how OLD it is will make a small difference. And someone else's recipe which turned out good at 950 watts for 6 minutes might not work for YOUR 950 watt machine at 6 minutes, because your machine might be newer or older. It is just a trial and error process for your machine; start with less time so you can put it back in the microwave oven and add 2 more minutes. I tried these today and they turned out fantastic! No need to pay high prices at the candy store. I'm thinking they will be included in Christmas gifts next year. I tried these and they came out okay, heres what I did just incase someone has the same questions I did going into this. First of all, I have a 1100 watt microwave. So I mixed everything together in a (rather small, maybe 5 cup) glass bowl. Microwaved for 6 min, stirring every 2 min. I tried your caramel recipe last night and it came out perfect! I have an 1100 watt microwave. I put the ingredients in the largest Corelle bowl that would fit in my microwave. I used one-half cup sweetened condensed milk. I set the timer for 2 minutes. When it stopped I stirred the ingredients well. I did this a total of 3 times for a total cooking time of six minutes. I took my time and really stirred the ingredients well each time it stopped. I them poured the contents of the bowl, which I was holding with an oven mitt, into a Pyrex 8 inch by 8 inch casserole baking dish which I previously sprayed with Pam Original. I let it sit in the fridge for several hours to cool. I then took it out and covered it with the glass lid. When it had sit several hours and returned to room temperature, I removed the caramel "Pancake" and cut it into bite sized pieces. I cut wax paper to wrap the caramels, but haven't had much luck getting that done. So far about a third of the caramels have disappeared. My only regret is that I didn't discover your recipe before Christmas. We had a house full of people and I know this item would have been a gigantic hit. Thanks so much for sharing this winning recipe. I'm sure we will use it again and again. It really takes the work out of making caramels. Oh, they taste great and are the perfect consistency! My wife and I really love the caramels and how easy they are to make compared to the stove method. We had several of my daughters teenage friends over for the night (fellow Cheer Leaders) and not only the teenagers, but the parents loved them too. My wife is a super cook and when she says something is great, you can count on it! She really loves these caramels. A recipe like this doesn't come along often. So glad you gave it to everyone. I'll let you know if I find any other great recipes like this. Maybe I can share one with you. I'm a chocahalic so maybe I can return the favor in the sweets department. I'm glad your thumb is okay. I'll try adding some coarse salt to my next batch! I love a good salty sweet combo. Oh wow. Did they melt in the coffee? That sounds divine. Sounds delicious! !I am so trying this soon. Thanks! Thanks - let me know what you think! Just tried these! I added 30sec cooking time because I think my little microwave is a 700 watt. The mixture was bubbling when it came out. Left some in the bowl and used it for apple dip. Can't wait to try a caramel when cooled, also sprinkled 1/4 with sea salt, curious! mmm. . . sounds yummy as an apple dip! I bet it will be great with sea salt too. Hey Jenn, Thanks for this amazing recipe. I have the very best caramel recipe but its really expensive and takes a long time to make so I dont end up making it very often. This recipe rocks!!!! I have a 1250 microwave but I did end up tweaking the time a little. I ended up stirring after 30 second bursts because it would rise and boil up in the micro... I have an instant read thermometer (supr inexpensive at Harbor Freight). I waited till it read 237 and then poured to cool on parchment in a pyrex. I also added 1/4 tsp salt and some vanilla paste. It was pretty close to my expensive 1 hour long recipe.... Im sold. This is amazing and fast for that quick treat. Thank you Thank you!!!! I've commented before about how much I love these but honestly, I just need to tell you again! I come back to this recipe all the time and it is one of the most requested treats I make. I always do mine for 7 minutes because I prefer slightly firmer & chewier caramels and to date, I've never had a problem when making these. Thanks so much for a wonderful recipe! Saw this recipe and RAN to the kitchen and made it! So Fantastic (and soft). Thank you! I totally RUN to the kitchen too when I find yummy recipes!!! I'm so glad you liked them.